The first of a new series by Jennifer Fallon, I’m sure this novel will please her fans and has enough drama, magic and romance in it to satisfy fantasy fans in general. The premise is an alternate reality or realities where history’s course has run differently to ours. The alternative universe in which much of the action takes place is one where the Romans were driven from Britain after the Sidhe (pronounced “shee”) or the wild spirits or faeries of Celtic Britain gifted their magic to the druids. Their intention was to create a ready army of magic-wielding defenders to keep the invaders at bay. The druids succeeded and subsequently became a world power following the Roman decline. 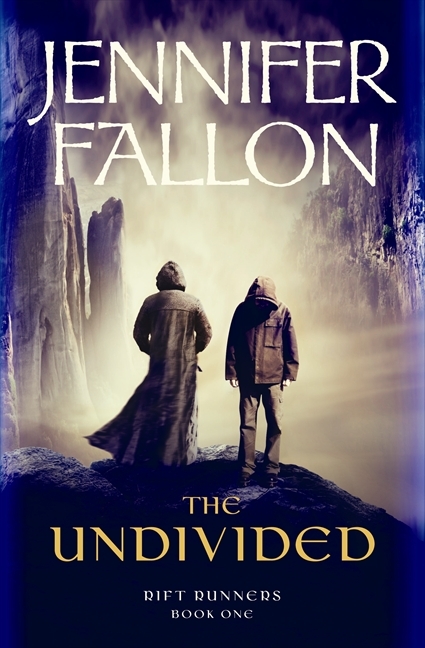 The Undivided are a pair of psychically gifted twins who are able to channel the power of the Sidhe to the Druids. As long as these twins live, the pact between Druids and Sidhe continues. To the dismay of the faeries who had assumed that the Undivided were a temporary measure to contain the Roman attack, the Druids have managed to find or breed psychic twins for hundreds of years and thereby retain the Sidhe magic. Enter the conflict – the head Druid, the Vate, is convinced by a Sidhe lord that the newly invested young Undivided twins pose a terrible threat to all Sidhe and Druids. He betrays his charges, and exiles one of the twins through a rift – a portal to another reality – into a world where the Romans won and magic was lost to the world. Our world. The story centres on the each of the Undivided twins, Ren in our world, Darragh in the magical celtic world and the political machinations around the Sidhe and Druidic struggle for supremacy and control of the Sidhe magic, and the cultural clash between a magic-infused world and a technological, magic-poor world. My initial impression of this novel wasn’t favourable. I first read the blurb and found the phrase “The Undivided are divided” quite jarring and amateurish. In contrast, the overall name of the series, Rift Runners, seems more appropriate. Additionally, I found it difficult to follow for the first chapters of the novel. I didn’t feel instantly invested in any of the characters and felt overwhelmed by the sheer number of actors Fallon brought early to her stage. She begins with a prologue, then a dream sequence in the first chapter but without giving the reader the benefit of context, and then chapter two opens with a minor character’s point-of-view. Not until chapters four and seven do we meet the protagonists of the novel! As a result, the reader is given a lot of new characters, concepts and settings before the story has been grounded in the lives and turmoils of its main characters. Nevertheless, I believe the novel will please with an intricately woven plot saturated with detail enough to satisfy most. Note: this review was of a pre-published copy of the novel, and as such any changes or amendments have not been taken into account. Particularly the many typographical errors have been ignored.